Independent Study - Business Starter Bootcamp: LESSON 4 - What Does it Really Mean to Invite? LESSON 4 - What Does it Really Mean to Invite? As you learned in New Coach Training, one of your Vital Behaviors each day is "Inviting". It tends to be the vital behavior that gets slacked on the most because it requires you to go outside of your comfort zone more than the other two do. But... in the beginning especially, before you've built up momentum and an audience, it is PIVOTAL to get the ball rolling by personally inviting people to join you. So what does that look like? In old school network marketing it meant inviting people to "opportunity" meetings or events or setting up house calls or parties where the products were displayed and a presentation was given. THANKFULLY, we are NEW SCHOOL! wink emoticon And we can use social media and a more personal touch to invite in a way less uncomfortable and way more personal way! What do we mean when we say INVITE? What does that ACTUALLY look like? See the image attached. 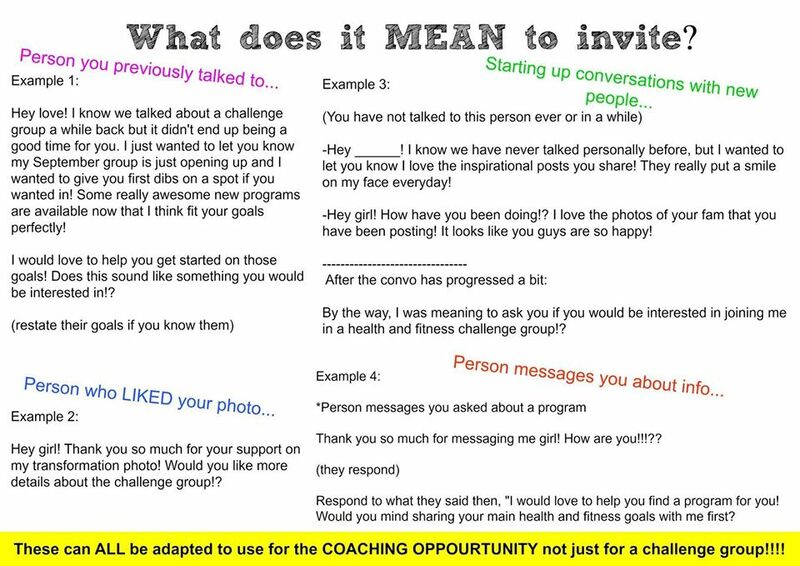 These are real sample conversations sent to potential challengers (or potential coaches) with the different types of relationships listed so you can get an idea of what to say and how to say it. See? It's really quite easy! Your assignment for today is to send FOUR invitations before the tonight. 1 using each method in the photo above! Post a screenshot of one in the team page when you are done. If you get stuck, ask for help!